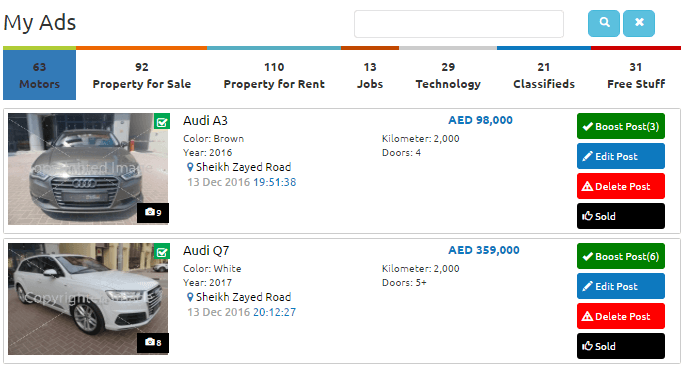 TapUAE granular dashboard is the primary tool for Tappers that enjoy self steering live feed ads. Push Button publishing. Through the dashboard, users are able to comment, edit post, boost ads, upload images and videos, renew ads and communicate with buyers directly. Tappers are also able to connect their live ads to their Google and Facebook accounts. Whenever they make a post, it will also be aired on social media. 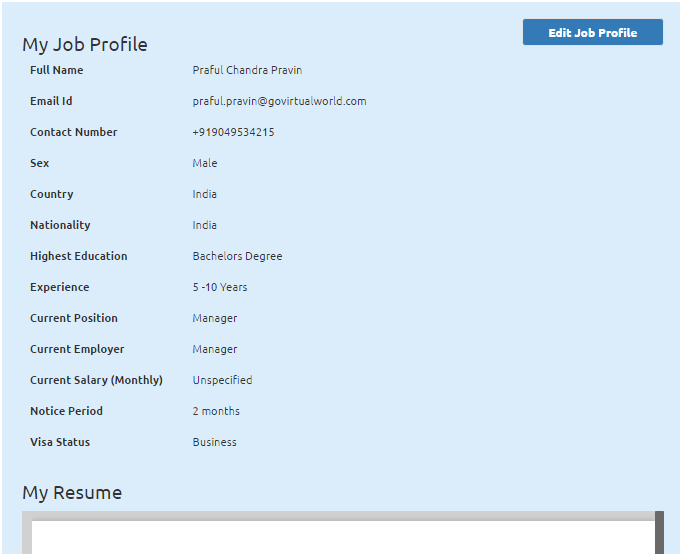 In the first glimpse, you can analyse which section can fullfill your requirement. Ex. I need to see how much I paid for publishing my Ad, Just click "Payment History". You will see transaction details and Invoice as well. The dasboard is designed in such a systematic way, so that you can navigate among the sections easily. We have accumulated all the information related to you at one place. If you face any problem in finding your related data, We are always ready to help you. Please contact our support center +971 0 000 0000. "Companies, in response to slower market activity, are doing workforce optimisations across the board, some even starting at the top layers where cost savings are obviously greater". In this scenario who doesn't want to search Jobs on regular basis. My Job Profile section will help you update your professional profile. You can even upload your update CV whose preview can be seen here as well. We have numerous Recruiter, Head Hunters, Consulatant who are having eye on the Job Wanted Section of TapUAE. Keep your Job Profile updated and give your professional acheivement as your title, so that recruiter can get the clear idea of your professional acheivements and can shortlist you easily. This section belongs to Head Hunter, Company, Recruitment Agencies. 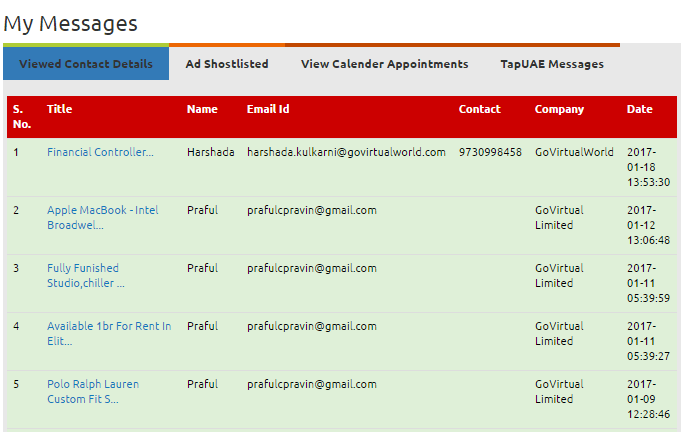 You can view list of all the shorlisted candidates from Job Wanted Section of TapUAE. You can search from the listed candiates. 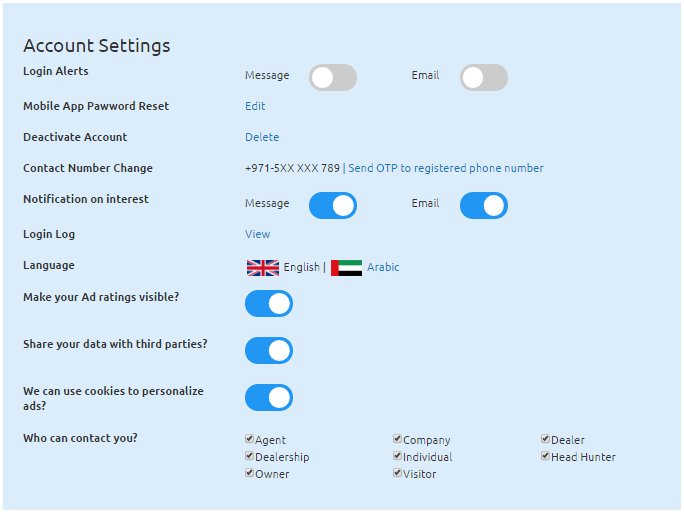 Contacting Candidates is an additional feature of TapUAE- Please contact to our sales team at +971 0 000 0000. As the name suggests, it contain all your transaction details which is successfully processed - all successfully processed transactions can be viewed at a glance. Invoices are electronically sent at the time of purchase. Additionally, all your previous paid invoices are detailed under payment history. If you have any query regarding payment processing or something else, please provide payment id for the reference. 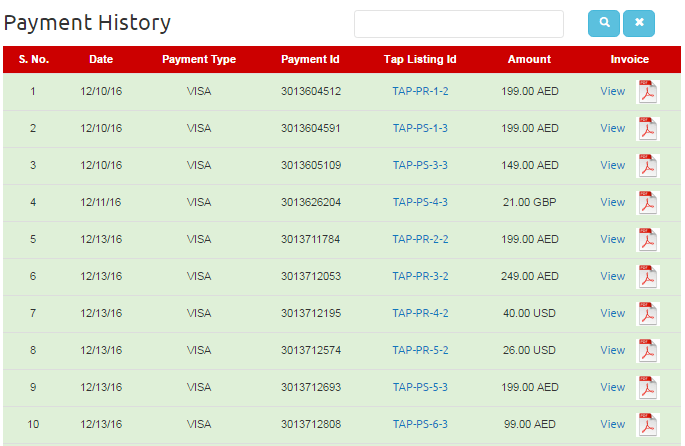 You can search payment history on the basis of Tap Listing Id, Amount and Payment Id. Category wise listing of all your expired ads. Your Expired Ads will remain parked here unless you republish it. You can see how many expired ads listed under each category. If your Item is still not sold, then you can republish it. You can edit the Ad or delete it from this list. The Ads where payments are not processed by Tappers or saved for later postings. You can view all those ads in this listing. You can edit your ad before publishing. After publishing your ad, it goes under review. All the free and paid ads after publishing goes under review section. To avoid duplicate ads, spam or other unauthorized ads, we go through each ad carefully. All the ads are listed on the basis of corresponding categories. Even if you edit your ad, it goes under review section just to monitor the changes you have done in your ad. All the active ads on TapUAE is listed in this section. 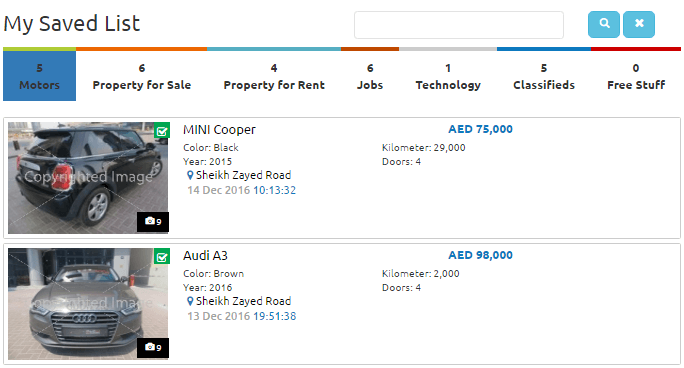 You can see the same card view of your active ad published on TapUAE. Tapper account profile has the functionality to change password after login. You can add if you own a company and would like to post on the behalf of your company. 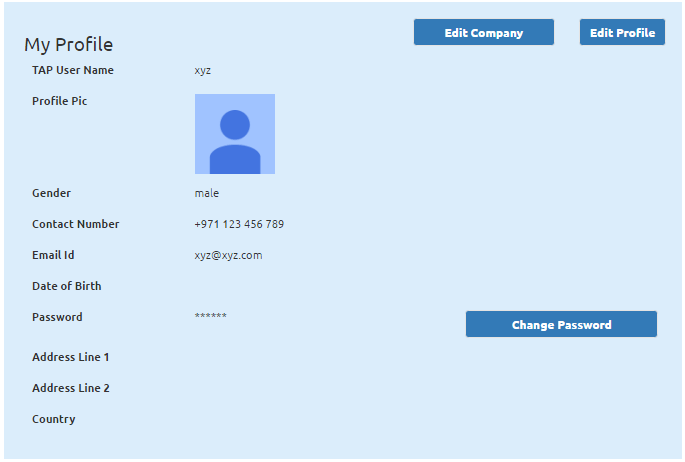 You can edit your name, profile pic and address section from this page. 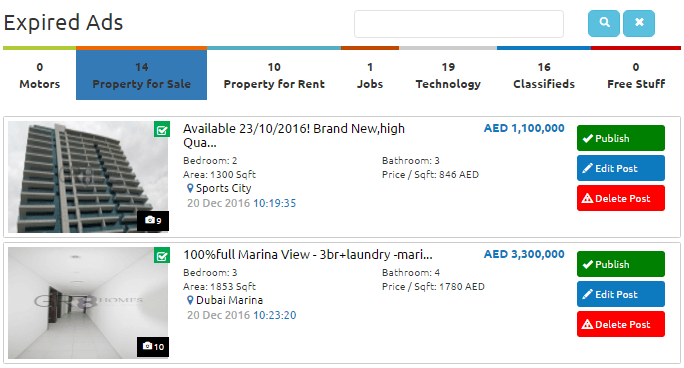 While going through TapUAE website, you must have seen "Email" and "Call" button in each ad post card. Once you click on it, that ad gets shorlisted in your dashboard and reflects here. We have saved thos ads for future refrence. 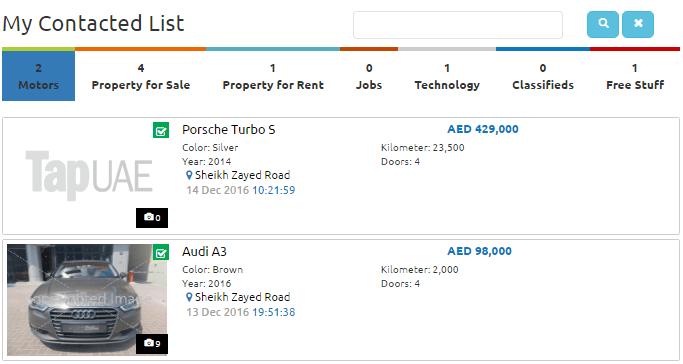 You dont have to restart your search again on TapUAE, all those ads are accessible on one page. We have given you an option to shortlist an ad for future refrence. Once you click associated to an ad, it gets saved here. This list can also be accessed from right floating My Account Sidebar. When you click the title of an ad, it goes to Ad detailed page. If you would like to contact the seller, you can view the seller information under overview section. All the secutiry related settings has been accumulated here. Notification on interest if someone click - call or email button of your ad, or shorlist your posted ads. You can see history of all your login details. You can control your ad ratings visibility to visitors. 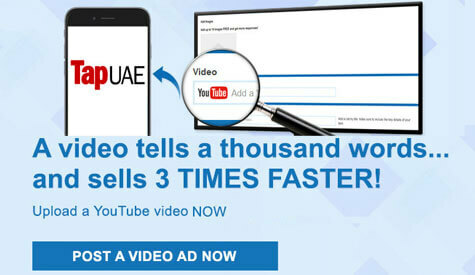 Whether you would like to share your ads with third party TapUAE partners or not. All the categories are listed on the bottom of this page. 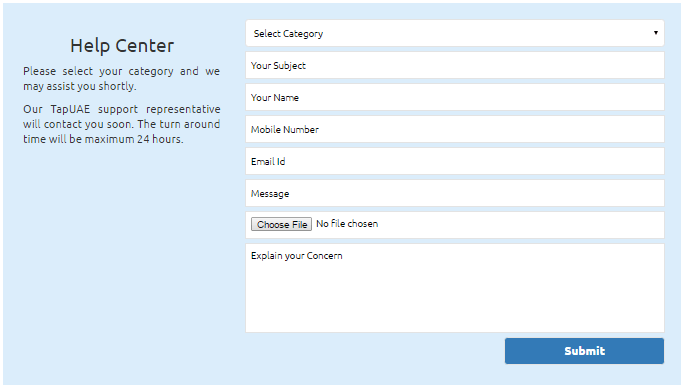 You can opt who can contact you via email or telephone number given in your profile. All the ad related email and messages can be seen in this section. A copy of all the interested, shorlisted Tapper information is gathered here. You can see the detailed message who has requested you for appointments. We will contact you via "TapUAE Mesaages". All the replies through this medium will be ads related.